This incalmo bowl is made from four separate sections. Incalmo is an extremely complex technique where each section is made separately and then they are joined one at a time while the glass is still hot. From the top going towards the bottom, the colors begin with a beautiful pink section which is followed by a section each of clear, then a section of blue and another section of pink. As an aside, incalmo possibly refers to the calmness required to perform such a tricky operation, which only the most skilled glass blowers are able to accomplish. 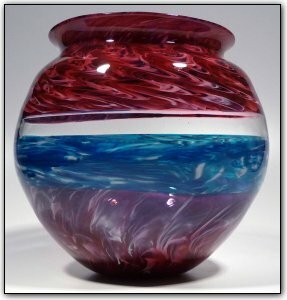 And Dirwood's incalmo pieces are some of the best and most beautiful in the glass blowing world!